Sigerson Morrison's Laboratory Boutique will be featuring the work of Tim Groen through September 20th. 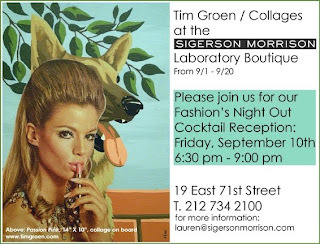 Special Cocktail Reception will be held on Friday, September 10th for Fashion's Night Out. September is a busy month for KiptonART, keep checking our Events Calendar as many new exhibitions and events have been added!